Preparation time was reduced dramatically with the use of BAL’s new floating uncoupling mat – Flexbone 2Easy – on a prime redevelopment in County Durham. 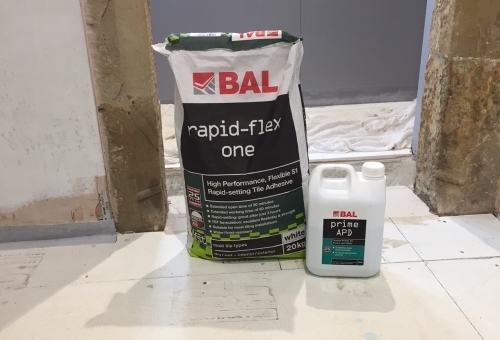 The 200m² problem screed to be tiled had two days of preparatory work scheduled before installation could even begin, but this was reduced to just half a day using BAL Flexbone 2Easy. Tile installation was onto a new pumped concrete screed, which had hairline cracks, residue and laitance on the surface. To fix tiles in a traditional manner – direct to the screed or using a bonded uncoupling mat – would have required the screed to be abraded to remove the laitance and significantly primed at considerable time and cost. The use of BAL Flexbone 2Easy floating uncoupling mat alleviated the need to abrade and prime the screed, as the only preparation required was a quick sweep of the surface. The mat was simply rolled out onto the screed, with the self-adhesive mesh bonding the mat edges together. Roll ends were secured with BAL AquaDrain ST-10 tape. 800mm x 600mm 10mm thick stone-effect porcelain tiles were then laid directly onto the matting and adhered with BAL Pourable One flexible tile adhesive and grouted with BAL Micromax2 Smoke. Karl Fortune, tiler at Fortune Tiling, said: “The mat was incredibly easy to use and saved me significant time and money on preparation and materials. BAL Flexbone 2Easy is a unique mat to the UK market which is truly uncoupled, protecting floor tiles from lateral movement. No removal or residue, no removal of laitance and no priming of the surface is needed. This means that contaminated and stained floors, wooden floors, cracked screeds and mixed substrates can be tiled immediately – as long as they are flat, level and rigid. As well as time savings from the lack of preparation, materials costs are also significantly reduced with no need for primers, plus a massive adhesive saving of 2kg/m², when compared to laying bonded cavity mat systems. Time trials indicate the removal of subfloor preparation for installations provides a minimum 50% time saving. Lengthy waiting times on new screeds are avoided as Flexbone 2Easy can be laid on new sand:cement screeds when they are ready to be walked on, or new anhydrite screeds that aren’t fully cured (up to 1.5% CM residual moisture). This means no more projects on hold for weeks on end waiting for the screed to dry! Fast-track installation is possible as any residual moisture in the substrate is distributed evenly through a system of perforations and channels in the mat, meaning the screed can fully cure under the tiling with no issues. BAL Flexbone 2Easy also featured patented GripLock Technology and unique bone structure. The patented design has been independently tested to provide the highest shear strength (providing more accommodation of higher levels of lateral movement) and the highest tensile strength (to stops tiles ‘popping-off’, or cracking under pressure). These highly flexible and deformable properties ensure all tile installations are protected from lateral movement and pressures. “I would definitely recommend the use of this product, particularly if there are issues with the substrate,” added Karl. BAL have worked in partnership with CJ Ceramics (est. 1985) and English Heritage for the stunning renovation of a Grade-1 listed 16th Century gatehouse on the site of “Robin Hood’s” Grave. Located on the historic Kirklees Estate in Calderdale, West Yorkshire, the Gatehouse is a now located on private land and used as a luxury rental residence. According to local legend Kirklees Hall is said to the final resting place of Robin Hood who was allegedly “murdered” on the site and buried nearby. 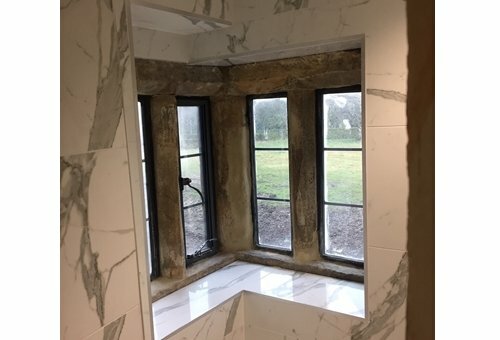 Craig Sellars from CJ Ceramics was commissioned to tile the interior of the gatehouse in Modena marble-effect porcelain supplied by Yorkshire Tile Company. Because of the historic nature of the building including fragile lime render, Craig called on the expertise of BAL Product Support Manager Lewis Lupton to provide a technical specification for fixing materials. 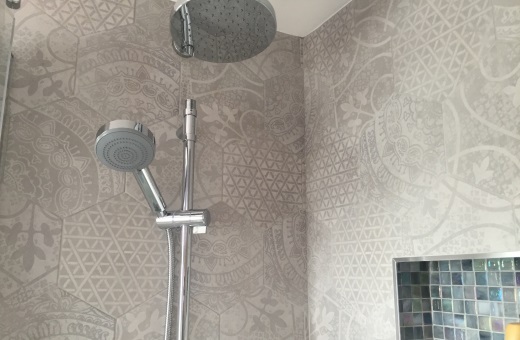 “As soon as I was commissioned for this project, I immediately called on Lewis to provide specification and product support as I would be tiling onto sensitive backgrounds,” said Craig. Original floor joists were protected with 12mm plywood over-boarded with 6mm BAL Board to create a firm base to tile onto. Recently launched, BAL Board is a lightweight tile backer board that is 15-35% lighter than traditional cement-based boards. Because no specialist cutting tools are required and the product produces minimal dust when cut, it is a perfect product for sensitive heritage backgrounds and environments. Following installation of the BAL Board, the surface was levelled with BAL Level Max as there were areas which had dropped 30mm due to due subsistence in the historic building. The 800x800mm tiles were then fixed with new BAL Rapid-Flex One – a new all-white S1 adhesive with improved flexibility and strength. 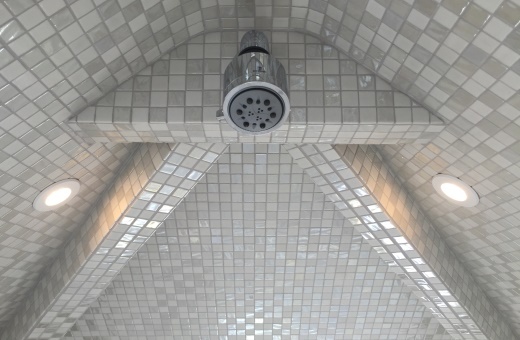 Because of its unique formulation, BAL Rapid-Flex One has an extended open time of 30 minutes and working time of 60 minutes, while it can still be grouted after only three hours. Where necessary, Craig tanked backgrounds with BAL Tank-it – a rapid-setting tanking system which can be tiled on only 90 minutes with no priming needed. To tile onto the historic lime render, Craig removed any surface efflorescence before priming with two coats of BAL Prime APD followed by a skim coat of flexible adhesive. Following another priming coat, the tiles were fixed with BAL Single Part Flexible. Following installation of the tiles, they were grouted with BAL Micromax2 in White with edges and corners sealed with colour-matched BAL Micromax Silicone Sealant. “It was a fantastic job to be involved with in such an historic building. Thankfully I had the support of BAL to ensure the right fixing solution was found,” said Craig. 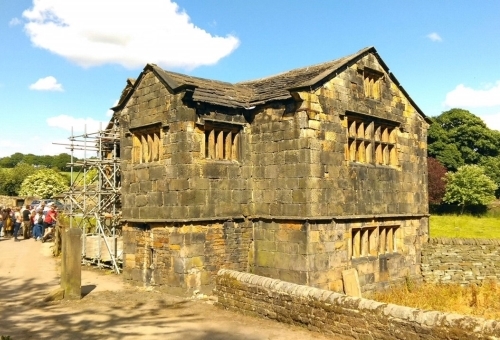 Description: Complete renovation of historic gatehouse on the Kirklees Estate, home to the “grave” of Robin Hood. 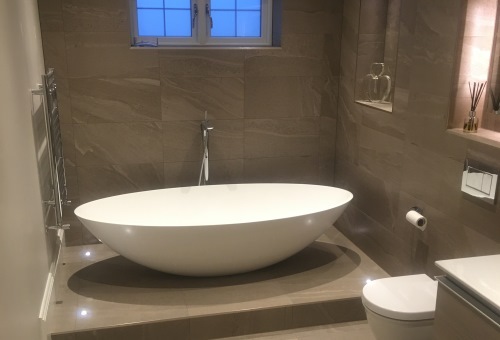 BAL has provided a full tiling solution for the renovation of a six bedroom country house in Cheshire tiled by Mark Isherwood from Artisan Tiling. Featuring intricate brick slips, porcelain plank tiles and polished porcelain, the stunning redevelopment also features an external water feature tiled with split face stone. A total of 400m2 of tiling was completed on both the ground and first floor of the property including the kitchen, four bathrooms and a cloak room over a calcium sulfate screed which was sanded and primed with BAL PRIME APD and decoupled using BAL RAPID-MAT uncoupling mat system. 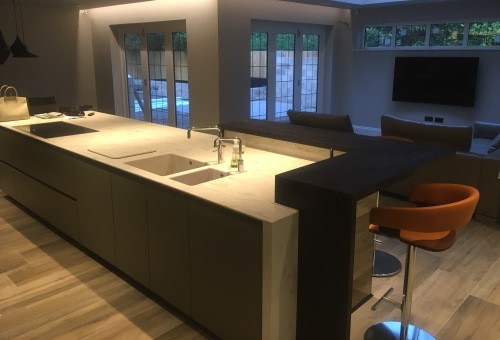 Designed by Stuart Frazer Kitchens, the kitchen area features 1200x300mm Argento Sycamore porcelain plank tiles and a wall feature with split face stone supplied by Mandarin Stone. 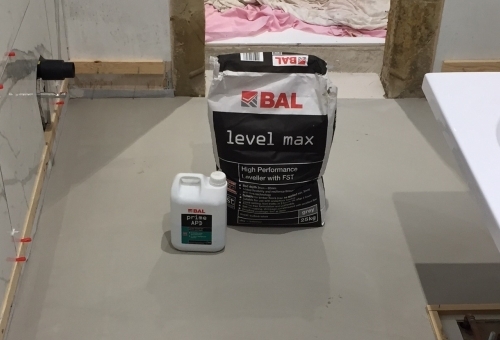 As the kitchen and hallway floors weren’t flat, Mark used BAL LEVEL MAX levelling compound to create a smooth and level surface to tile onto. The four bathrooms and the ground-floor cloakroom were all designed by Emma Scott from C.P Hart and feature a range of polished porcelain tiles. Tiled in a linear pattern, the master en-suite features 895 x 446mm Jumble Cemento tiles, while the loft bathroom is tiled with Aalto Collagna on the floor with 596 x 596mm tiles, and 596 x 295mm tiles on the wall in a linear pattern. The main family bathroom at the property is tiled in dark brown Aalto Toanna, again in a linear pattern on the floor and walls. The ground floor cloakroom is tiled in Aalto Cerreto 600 x 300mm also in a linear pattern. Aalto is a colour-bodied porcelain tile inspired by the hills of central Italy. The warm, organic colours vary markedly within each tile, reflecting a natural landscape. 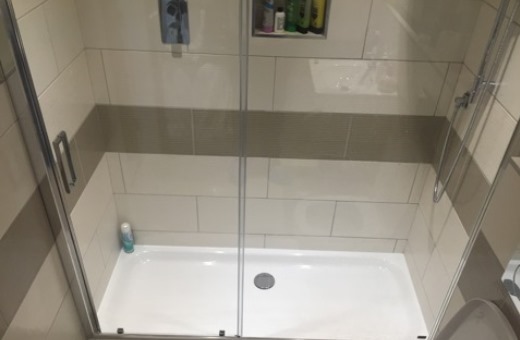 All floor tiles were fixed with BAL SUPERCOVER RAPID-FLEX adhesive and grouted with BAL MICROMAX2 Smoke, while all wall tiles were fixed using BAL SINGLE PART FLEXIBLE in white or grey and grouted using BAL MICROMAX2 grout in varying colours, all primed with BAL PRIME APD first. BAL worked with Artisan Tiling to provide a full M40 Specification and on-site project support including screed testing on the calcium sulfate screed by Lewis Lupton, Product Support Technician for the North. 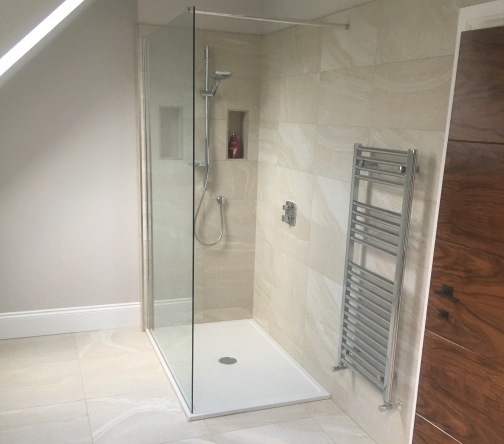 On completion of the project, Mark said: “This was an amazing project to be involved with, featuring high quality designs, superior tiles and last, but not least, great fixing materials. “I am a great fan of BAL whose products I use on a regular basis. You can always trust BAL for quality, plus they give you great back-up. As soon as I won this job I phoned Lewis who wrote a full specification and came on site to test the screed for moisture. Description: High quality tiling kitchen, cloakroom and four bathrooms of a six bedroom country house in leafy Cheshire. 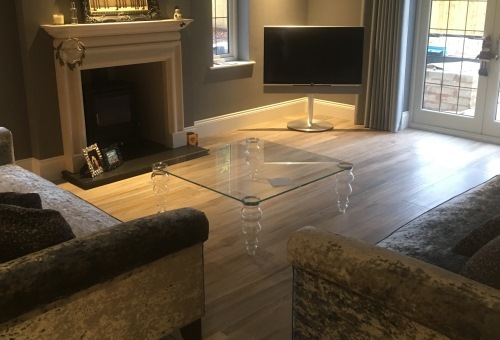 BAL, the UK market-leaders in full tiling solutions, have provided a full system solution of tiling products to help transform a high-spec six-bedroom mansion in Hale Barns, Cheshire. Shortlisted for the The Tile Association (TTA) Awards 2016 for Best Use of Tile in a Domestic Environment category, the project was completed over a six-month period by Dave Stott from Elite Tiling Ltd. 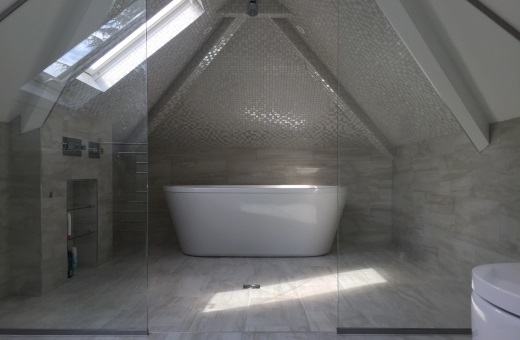 The high-spec property is a fantastic example of modern tiling, including the creation of a stunning mosaic wet room and bathroom that was previously an unused attic space and a complex hexagonal patterned tiling installation in one of the en-suite renovations. BAL tile adhesives, grouts, sealants and preparation products were specified throughout the project which included a family bathroom, and four ensuites, including master ensuite and guest ensuite, each with their own unique patterns and styles helping to create a stunning property in the Cheshire countryside. BAL worked extensively with Dave Stott including specification support from BAL’s Technical Advisory Service (TAS) and on-site support from BAL’s expert Product Support Technicians. “BAL were absolutely brilliant from start to finish, visiting the site to assist with product specification and technical advice,” said Dave. Fixed with BAL Supercover Rapidset Flexible, BAL Single Part Flexible and grouted with BAL Micromax2 Gunmetal, the stunning 29m2 family bathroom features stunning 300 x 600mm Purestone Grigio Natural Rectified Porcelain tiles fixed in a brick bond pattern on both walls and floors. The area around the bath and shower area was tiled with textured Purestone Grigio Muretto 3D Décor tiles fixed with BAL Single Part Flexible. 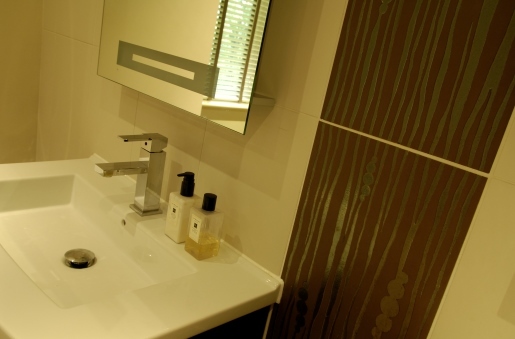 Not only do the textured tiles provide a stunning finish to the bathroom, they also deliver longevity, protecting against damage, wear and tear. Situated at the front of the house, the 14m2 Ensuite 1 features striking 266 x 230mm hexagonal tiles (Alchimia Mix 1 Bianco Grigio and Alchimia Esagono Bianco) for the walls, floors and shower area. Before tiling commenced, the floor was primed with BAL Bond SBR, Wedi boards at 6mm were installed and under floor heating mat laid and covered with BAL Fibrebase levelling compound, before the tiles were set-out and fixed. Without doubt the biggest challenge of the room was the setting out of the walls to ensure perfect symmetry of the room – including intricate internal cuts to ensure the correct pattern and size continued around corner with perfection. The finished walls and floors were grouted with BAL Micromax2 Gunmetal and sealed with matching silicone. Ensuite 2 is tiled with large format ceramic tiles (Modern Colour White and Modern Colour Silver) in brick bond pattern on the walls and glazed porcelain on the floor fixed with BAL Single Part Flexible and BAL Supercover Rapidset. 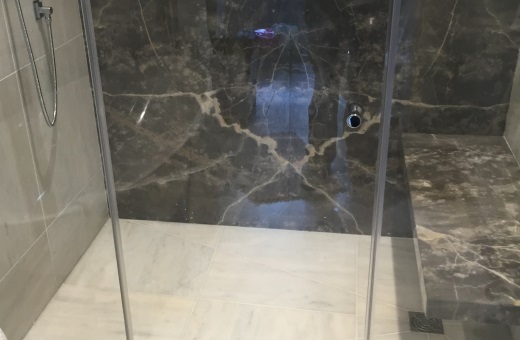 Featuring a number of intricate recesses, the bathroom was also finished with BAL Micromax2 in Gunmetal and colour-matched BAL Micromax Sealant for consistency of colour and tone. 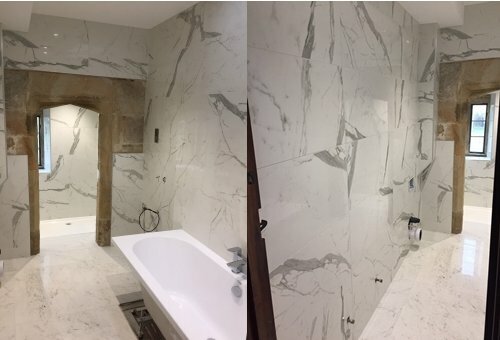 Tiled with stunning book-matched marble by Isaac Davila from Rockford, Fior di Bosco and Rosa Auria Extra, the 22m2 master ensuite is an ode to high quality tiling. Fixed with BAL Single Part Flexible on the walls and BAL Supercover Rapid Set on the floors, the ensuite features a walk-in shower with a brown marble book-matched seat and recess. 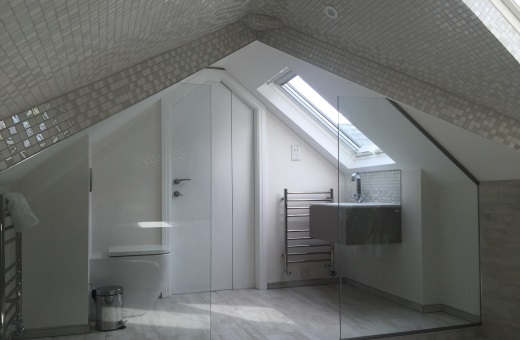 A converted attic space used to accommodate guests, the Guest Ensuite is surely the property’s pièce de résistance. After extensive and exhaustive preparation work including the cladding of the entire room with tile backer-board and double scratch-coats, the room was tiled with 5mm x 25mm Stone Glass Mix White mosaic tiles which curved around the upper radius of the room, and Petrified Tree White Lion Core Natural Porcelain Tiles fixed with BAL Supercover Rapidset and grouted in a brick bond pattern on the walls to complete a simply stunning wetroom. 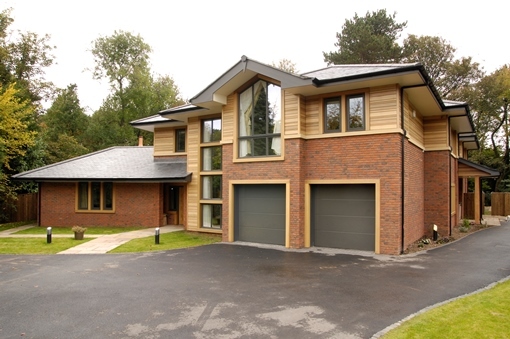 High quality tiling throughout six-bedroom, five-bathroom property in the heart of Cheshire. This new, large private home was designed to combine clean, good looks with energy efficiency and the ultimate in convenience. 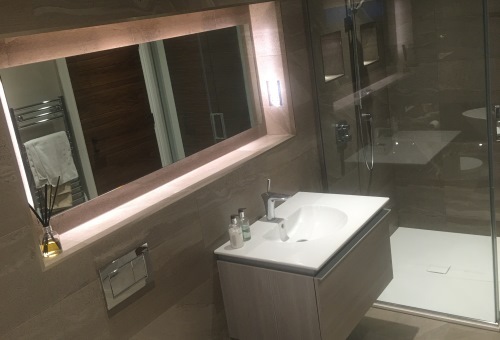 The ensuite master bathroom and sauna is complemented by further guest and children’s bathrooms, all tiled to the highest quality standards with BAL tiling products. The home of our dreams is already a natural goal for most. Today, there is also increasing consciousness of our responsibility, as individuals and as society, to reduce our carbon footprint. That was certainly the aim of the Grant family when planning the major redevelopment of their Manchester property. They were committed to ensuring that the works could be achieved sustainably with maximum protection of the environment. Tiling was the natural choice for the décor of the three bathrooms and sauna included in their plans. This would create the right context, and ensure lasting quality, for the anticipated relaxed enjoyment of these facilities. However, their eco-build vision needed to be reconciled with a variety of individual challenges from each of the rooms. Some related to the different tiling backgrounds, and to proposed additional installations such as under tile heating. Others concerned the variety of tile types and sizes to be used to create each distinctive design. All this called for specialist expertise and guidance to ensure correct specification as well as quality, value and peace of mind. The designers knew from previous experience how this could be assured: BAL products were to be used throughout, from priming to grouting including BAL Single Part Fastflex (elastomeric tile adhesive) and BAL Superflex (flexible tile grout for walls). A BAL Product Support Technician made a site inspection. The required products were duly defined in an M40 Specification. At the core of this specification was the desire to minimise the use of concrete, a primary raw material of most tiling adhesives and a recognised pollutant. As a pioneering market leader, BAL was able to provide a more eco-friendly option: BAL Fastflex. This is part of the BAL “Go Greener” range of specialist products. Like all BAL products, these are high performance and easy-to-use adhesives and grouts. However, they are specially formulated with alternative recycled fillers, which help minimise the carbon footprint of tiling. 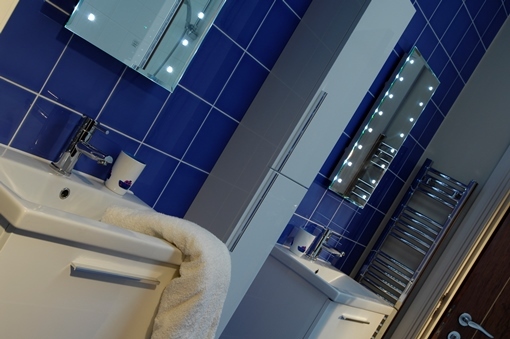 To continue this environmentally-friendly solution, BAL Microcolour grout was used in all tiled rooms. This efflorescence-free, fast-setting grout is formulated without OPC cement, and produces a smooth, long-lasting finish.